Researchers from the Perelman School of Medicine at the University of Pennsylvania and the Children’s Hospital of Philadelphia used gene therapy to improve the vision in three adult patients with Leber congenital amaurosis. The patients reported being better able to see dim light and had no adverse effects or immune reactions towards the inserted genes. Image: Jean Bennett, MD, PhD, Perelman School of Medicine, University of Pennsylvania; Manzar Ashtari, Ph.D., of The Children’s Hospital of Philadelphia, Science Translational Medicine. 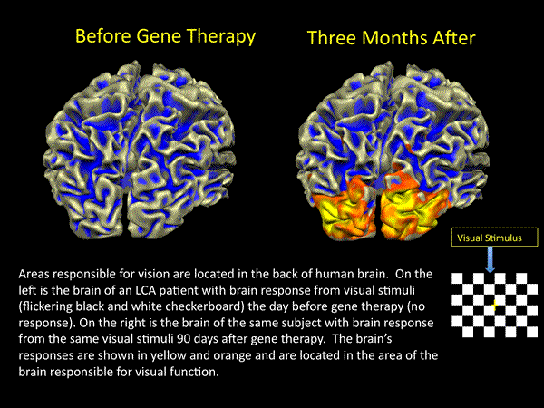 1 Comment on "Gene Therapy Improves Eye Function in Patients"
Good article on genes & therapy to improve eye function. Maybe this could be a new healing method for patients with eye problems & people wearing glasses?